Quake3 Arena is a multiplayer online first-person shooter released in 1999. There is a Quake3 HOWTO written by Jonathan Bergknoff that should be your first stop for a general overview. It should be your first stop because even though dated, it provides useful details on how to launch mods and fix problems. There is also an interesting Wikipedia page for Quake3. It is quite amazing to me that this game was released way back in 1999 as the third installment to ID's Quake series. I've played it ever since the release; it has quite a following. Since id Software released the source code for the Quake3 game engine licensed under the GPL, there have been several projects that have attempted to make not only a better playing game, but a better looking game. You need a valid key to play Quake3, so if you don't already own the game, purchase the Windows version of the game from STEAM or Amazon to obtain the key code. There are several different game engines and hi-res packs to choose from. What I'm presenting here is how I configure Quake3 on my Linux box. The game engine I chose is the ioquake3 game engine because that version is provided by my Linux distro, Mageia6. The binaries are placed in /usr/bin. In addition to /usr/bin/ioquake3, there is also /usr/bin/ioquake3-update which will update you to the most recent version. You will need to copy the original, non-free game data file, pak0.pk3, to /usr/libexec/ioquake3/base3q for use system-wide, or in ~/.q3a/baseq3. I suggest keeping the original game data files in /usr/libexec/ioquake3/base3q and any additional game data files in ~/.q3a/baseq3. If you do not own the game, Mandriva provides the ioquake3-demo package which, after installation, running /usr/bin/ioquake3-demo, will prompt you to download the demo version of the game data files. While not free as in freedom, the files are free as in beer. When first run, ioquake3 will ask for your game CD key. It will also create .q3a in your home directory if you have not already done so, a convenient and recommended location to place your mods and maps. One of the things to look forward to when playing these old games is the benefit obtained from newly created high resolution textures that make the gameplay even more immersive. With modern hardware, multi-core CPUs, multi-gigabyte blazingly fast video cards and high-resolution wide-screen monitors, what may have seemed state-if-the art 20 years ago, now appears a little drab and blocky. One of the hi-resolution textures from artist Paul Marshall. Unzip the downloaded archive and copy the files to ~/.q3a/baseq3. No further action is necessary. As well, there are the High Quality Quake 3 textures available from ModDB. Here as well, unzip the downloaded archive and copy the files to ~/.q3a/baseq3. No further action is necessary. 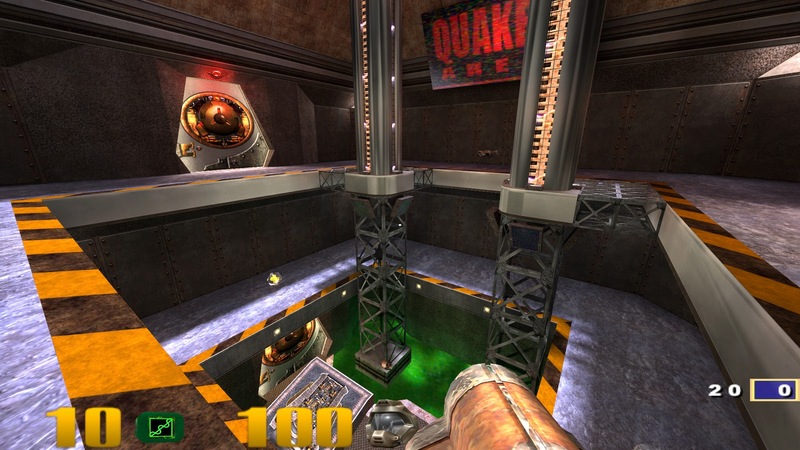 There are also several free games using the ioquake3 engine. The source code is freely available and GPL-compliant if you have a desire to do some work on your own or even create a new game. Besides Linux 64-bit binaries, also available are binaries for 32/64-bit Windows and 64-bit MacOS. Does in run in WINE?